Arrh Mateys, check out this Pirate Ship Collage. A fun an inexpensive Pirate Craft for Preschoolers on up! 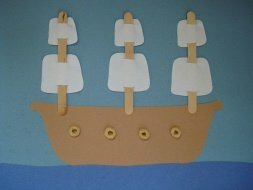 This craft is also a great activity for a Pirate Birthday Party! 1. To make ocean and sky you will need to cut a small strip of dark blue paper onto the bottom of the light blue piece of paper (you'll have to prepare this ahead of time for younger children). Trace and cut out the boat and sail shapes from the template. Have the kids glue the boat into the ocean. 2. Make two slits in each sail. One at the top and one at the bottom. Slide the craft stick in and out of the slits so that the sails stay in place. Younger children can just glue the sails on top of the craft sticks. 3. Glue the sails in place on the boat. Glue 3-4 Cheerios on the boat as windows, and now your Pirate Ship Collage is complete! Another option is to add cotton ball clouds onto your scene, just pull them apart a little and glue them on.